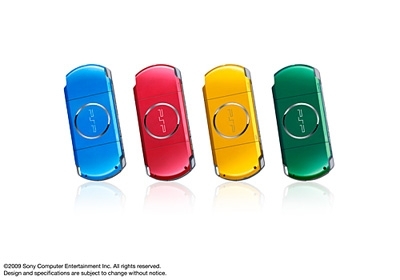 Earlier this month SCE Asia announced two new colors for the third-generation PSP (PSP-3000), Vibrant Blue and Vibrant Red. Now, Sony has announced that two new colors will be added to the line-up: Bright Yellow and Spirited Green. Sony also announced that they will be releasing new pouches and battery packs to match the Carnival theme. The Carnival colored PSP-3000 will retail for ¥19,800 (approx $225) and will be available this March. The battery packs, which will include a 2200mAh battery and a Carnival Color plate of your choice will go for ¥5,500 (approx $62). Lastly, the PSP pouch, which will also come in matching colors will go for ¥1,800 (approx $20). A value pack will also be available, which will include the PSP color of your choice, a 4GB mem stick, the pouch, a wrist strap and a cloth will be available for ¥24,800 (approx $280). As usual, there was no announcement of the new colors reaching the US or Europe.